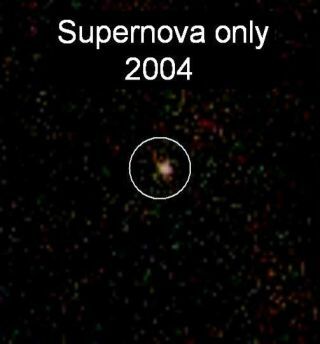 Image centred on the host galaxy, circled, of one of the distant supernovae discovered here. The constant light from the galaxy is removed, revealing the supernova. Theremnants of two massive stars that exploded about 11 billion years ago haveshattered the record for the most distant supernovas in the known universe. The farawayexplosive remnants, found using a new method, could help researchers learn moreabout the evolution of the universe, how the elementsin it formed and how they were distributed in later generations of starsand planets. "Whenstars explode, they spew matter into space. Eventually, gravity collapses thematter into a new star, which could have planets such as Earth around it,"said study leader Jeff Cooke of the University of California, Irvine. Before thediscovery of these distant supernovas, which belong to a category known as TypeIIn, the most distant known supernovas of the same type were 6 billionlight-years away, and the most distant of any supernova type were 9 billionlight-years away. A supernovaoccurs when a massive star (more than eight times the mass of the sun) diesin a powerful explosion. Type IIn supernovas result from the explosive death ofstars that are 50 to 100 times the mass of the sun. These stars shed most oftheir material before they die, and when they finally explode the remainingmaterial is spewed out into space, plowing through the previously expelled gas.The collisions between the gas clouds make the entire stellar remnant gleambrightly for several years after the star's demise. To findsupernovas, astronomers compare images of the same area of the sky taken atdifferent times. A new pinprick of light that appears in one image and seems tofade over time can indicate the temporary brightening and dimming of thestellar explosion. Cooke andhis colleagues used a variation on this traditional method: They examinedcombined data from the Canada-France-Hawaii Telescope Legacy Survey for thesame patch of sky for four different years. By comparing the images, Cooke'steam identified four very distant objects that appeared to brighten and fadeover time. The datashowed that the light from the supernovas had traveled nearly 11 billion light-yearsto reach Earth. That means the explosions happened 11 billion years ago, andthe light is just now reaching us. "Theuniverse is about 13.7 billion years old, so really we are seeing some of thefirst stars ever formed," Cooke said. Cooke'stechnique is "powerful and reliable," said astronomer AliciaSoderberg of the Harvard-Smithsonian Center for Astrophysics in Cambridge, Mass. Soderberg was not involved in the new study, which is detailed in the July9 issue of the journal Nature. The newmethod should make it possible to identify even more distant supernovas,possibly even some of the very first stars that blew apart. Other effortsalready planned, such as the Large Synoptic Survey Telescope, could identifythousands of candidate supernovas. "Thisnew method could not have been published at a better time," Soderbergsaid.